Access to all the latest news and coverage in one easy place. Call 1-800-804-2994. Our agents are ready to answer your queries. Is there a charge to download the Flow Football Radio app? No the app is free to download from your app store. The Flow Football Radio application is available through multiple devices including mobile and tablets. The application is supported on both Android and IOS platforms. 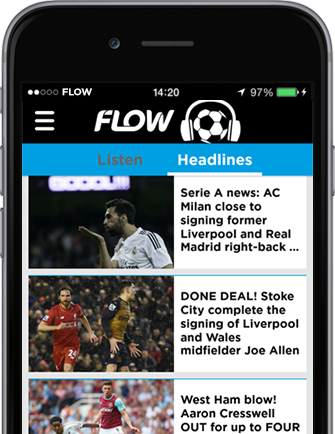 Which app stores is Flow Football Radio available? What happens if I changes my mobile device? If you change your handset you can transfer the app onto your new device. How much data does streaming the football matches via the app use? If you stream a full 90 minute football match via the app you will use approximately 60MB of mobile data. Does streaming through the Flow Football Radio app come out of my data allowance? Yes, if you stream the football matches over the mobile data network it will use data from your data allowance. You can stream through Wi-Fi which will not come out of your data allowance. What is the football predictor game from within the app? Flow Football Radio subscribers will be able to enter a weekly football predictor game which gives a grand prize of £1 million if they can perfectly predict the results of 10 games that game week. All you will need to do is create a free account to enter. 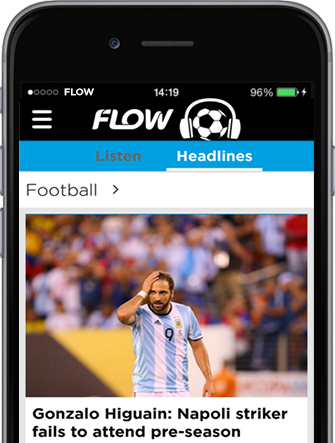 What are the main features of the Flow Football Radio app? Yes, both Prepaid and Postpaid smartphone customers can download and use the app. The content from the Flow Football Radio app comes from a company the UK called talkSPORT who are the world’s biggest sports radio station. talkSPORT is the official broadcaster of the Barclays Premier league, FA Cup and the Capital One Cup. What is Flow Football Radio? Flow Football Radio is an application where you can listen to live Barclays Premier League match commentaries, tuneto live 24/7 sports radio and read the latest sports news headlines and football transfer rumors on their smartphone or tablet.